"The regions described as amygdala nuclei encompass several structures with distinct functional traits. Among these nuclei are the basolateral complex, the cortical nucleus, the medial nucleus, and the central nucleus. The basolateral complex can be further subdivided into the lateral, the basal, and the accessory basal nuclei. Anatomically, the amygdala and more particularly, its central and medial nuclei, have sometimes been classified as a part of the basal ganglia." "The amygdala sends impulses to the hypothalamus for activation of the sympathetic nervous system, to the thalamic reticular nucleus for increased reflexes, to the nuclei of the trigeminal nerve and the facial nerve, and to the ventral tegmental area, locus coeruleus, and laterodorsal tegmental nucleus for activation of dopamine, norepinephrine and epinephrine." 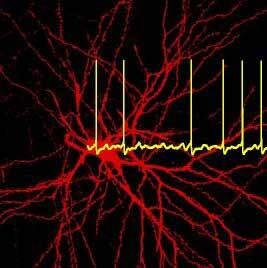 "In complex vertebrates, including humans, the amygdalae perform primary roles in the formation and storage of memories associated with emotional events." "The amygdala is an almond-shaped structure in the brain; its name comes from the Greek word for “almond”. As with most other brain structures, you actually have two amygdalae (shown in red in the drawing here). 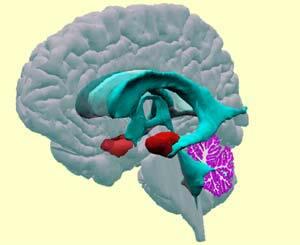 Each amygdala is located close to the hippocampus, in the frontal portion of the temporal lobe. That is why the amygdala has so many connections with several other structures in the brain." The statement that "As with most other brain structures, you actually have two amygdalae (shown in red in the drawing here). " is a little bit misleading. There are two of everything in the brain; one on the left and one on the right. This is no more true of the amygdala than of any other part of the brain. This is only the Beginner-Neurological Level. Click on the link. On the left side of the page there are links for Intermediate and Advanced, and on the right side of the page there are links for Social, Psychological, Cellular and Molecular. Each link leads to a different page covering the same topic from a different perspective. The next two links, below, are examples. Just because a given region of the brain is assigned a particular name rarely means that all of its neurons are homogeneous. On the contrary, these neurons are typically organized into specialized sub-groups. Each of these specialized groups of neurons within a given structure is called a “nucleus”. The amygdala, a brain structure that plays a key role in fear reactions, contains a number of distinct nuclei. The lateral nucleus seems to act as the main gateway into the amygdala. It is through this nucleus that the amygdala receives messages warning of danger, whether they come by the fast, direct route from the thalamus or by the slower route via the cortex. 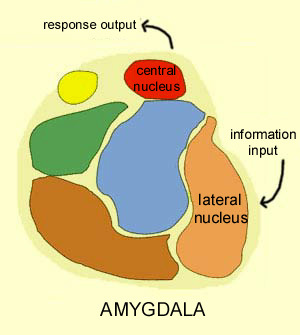 Another nucleus, the central nucleus, acts as the exit from the amygdala. The commands for the bodily responses associated with fear leave the amygdala from the central nucleus. In between the lateral nucleus and the central nucleus, several other nuclei gather information, process it, and send it on out via the central nucleus. Though not all of these nuclei are involved in the fear reaction, they do represent the centre of the body’s alarm system. " Because neuroanatomists distinguish many different nuclei within the amygdala, the term “amygdaloid complex” is often preferred to denote this structure within the brain. This term is all the more appropriate in that some of these nuclei can be further broken down into various divisions. The following table lists these nuclei and their divisions. Given all these nuclei and their many divisions, how does information circulate within the amygdaloid complex? Many studies have helped to reveal the wiring that enables the amygdala to detect potentially dangerous stimuli and orchestrate an appropriate physiological response. First it was noted that the projections from the sensory regions of the brain enter the amygdala via the lateral nucleus, which constitutes the main gateway to the amygdala, though not the only one. Some projections from various parts of the brain also converge at specific nuclei of the amygdaloid complex. For example, some projections from the entorhinal cortex terminate mainly in the basal nucleus, but also go to the central and lateral nuclei. The projections from the hypothalamus go to the central, medial, basal, and accessory basal nuclei. Neuron in the lateral nucleus of the amygdala Source: Thomas Heinbockel, University of Arizona. These observations suggest that the information that enters the amygdala becomes represented at multiple locations within it. Moreover, there seems to be a point-to-point correspondence in the way this happens, so that the spatial organization of the groups of neurons is preserved. The integration of these various representations, which originate in systems responsible for such widely differing functions as long-term memory, internal balance, and auditory perception, therefore depends on the numerous internal connections among the various nuclei of the amygdala. The evidence does seem to indicate that these connections are sufficiently numerous, complex, and diversified to play this role. Indeed, contrary to what was initially believed, the information flow within the amygdala is highly reciprocal. It does not simply travel in one direction, from the main entryway at the lateral nucleus to the exit from the central nucleus. Indeed, most of the main targets of the lateral nucleus send projections back to it as well. The representations thus encoded in the amygdala and modulated by other brain structures ultimately converge at the output areas–primarily the central nucleus and the amygdalohippocampal area. This integration enables the brain to generate an activity pattern that can trigger the appropriate changes in the various structures responsible for the emotional reponse to the situation.